Samantha (Sam) is a wildlife researcher with the Monteith Shop where she tackles a variety of questions relating to the nutritional relationships between wildlife and the environments they rely on. With an eye toward wildlife management and conservation, Sam's research is often focused on how changes to environmental conditions—both natural and human-caused—influence the behaviors, life-histories, and survival of individual animals and populations. Her graduate work at the University of Wyoming explored how behavioral responses to human disturbance associated with energy development influenced the nutitional interactions between mule deer and the sagebrush habitats of their winter ranges in western Wyoming. Prior to joining the Haub School, Sam worked with a variety of wildlife species throughout the U.S., ranging from songbirds in Minnesota, to Canada lynx in Colorado, and gray wolves in Montana. 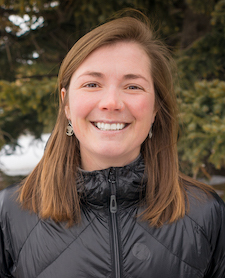 Outside of her research, Sam is an avid backcountry skier, mountain biker, and aspiring elk hunter. Dwinnell, Samantha P. H. 2017. "Risk effects of human disturbance on the foodscape for a large herbivore: Nutritional relationships among behavior, forage availability, and human disturbance." MS thesis. Department of Zoology and Physiology, University of Wyoming. Aikens, E.O., M.J. Kauffman, J.A. Merkle, and S.P.H. Dwinnell, G.L. Fralick, and K.L. Monteith. 2017. "The greenscape shapes surfing of resource waves in a large migratory herbivore." Ecology Letters 20: 741—750.